Broadly speaking, mathematicians can be divided into those who like analysis, and those who like algebra. The distinction between the two types runs throughout math. Even those who work in areas that are far from analysis or algebra are very aware of the difference between them, and usually are very clear on which their preference is. I’ll delve into this in more depth soon, but for now let’s just take it for granted that this is a well-known distinction, and it has meaning for mathematicians. There were a number of mathematicians present whose fields of study didn’t make it clear whether they were on the analysis or algebra side of things. We went around and asked, and in every case the way they ate corn matched their preference. Since then I’ve made a point of amusing myself by asking mathematicians I meet whether they prefer algebra or analysis, and then predicting which way they will eat corn. I’m probably up to 40 or so by now, and in every case but one I’ve been able to correctly predict how they eat corn. The one exception was a logician who claimed to be exactly on the fence between the two. When I explained the corn thing to him he looked surprised, and said that he had an unusual way of eating corn. He went in loose spirals! In other words he truly was a perfect combination of algebra and analysis! If you have even a passing familiarity of probability, it is clear that despite how unbelievable it initially is that the type of mathematics you prefer is connected to how you eat corn, it is pretty much certain that there actually is a very strong connection. If you believe, as I do, that this difference is connected to how we think about other things, then there must be some odd connection between how we like to understand the world and how we eat corn. The post later went viral on Hacker News, r/math, and Twitter; it was even the subject of a keynote speech at a math conference. These were separated by three unrelated questions, so that most participants would not realize that they were meant to be connected. An informal survey of participants suggested that although some of them had read the Tilly article and realized that the survey was testing it, most did not. A chi-square test confirmed that there was no significant difference between the two groups. Again, chi-square test confirmed there was no significant difference between the two groups (and notice also that the non-significant trend is in the opposite of the predicted direction). Now, for the only data point I have: I am decidedly an algebraist and not an analyst, and as best as I can recall I might eat corn in either of these ways, or in a combination of both ways, on any given day. I would imagine the same is true of most people. As to why he gets such consistent answers, I’ll note that when I read the assertion “algebraists do this, analysts do that,” I thought, “Oh, yes, I do eat corn that way.” After thinking a bit more carefully, making the interpretation I describe in the second paragraph, and then envisioning eating corn each way, it became clear to me that I’ve eaten corn both ways. So I imagine this whole thing is some combination of the power of suggestion and, perhaps, a selective memory on the part of the author. But do some people genuinely eat corn more one way or the other? If so, what determines this? I analyzed this question by gender, race, ethnicity, subethnicity, religion, sexual orientation, social class, neurotype, and political affiliation (I love this dataset so much). I’m not going to do this rigorously because there are too many comparisons and it’s not worth it, but just eyeballing things it looks like eating-in-rows came to America with the earliest English colonists, and eating-in-spirals is more common among more recent immigrant groups, especially Hindu Indians. I don’t have great data for most countries, but the few European countries where I have a decent sample size seem somewhere in between. I would make a joke about Western linear thinking vs. Eastern cyclic thinking, but I’m worried someone would take me seriously. I have no good explanation for why these groups eat corn the way they do, or why there’s so much variability even within them. If you want to confirm or expand these results, you can download the original dataset at the bottom of this post. This entry was posted in Uncategorized and tagged original research, survey. Bookmark the permalink. If you are bored and want a laugh, look up “Proof of the Riemann Hypothesis.” There are a lot of results there that fail to replicate. Perhaps Hindus more likely to be analysts, in keeping with their spiral preference? I realized after answering that I’ve also eaten it both ways. I *think* I’m more likely to eat in rows if it’s a full cob (requiring two hands to hold), and more likely to eat in spirals if it’s a half cob (requiring only one hand to hold). But I’m not really sure anymore. I imagine myself eating in rows because that’s what I did as a kid, emulating cartoons, and that’s what I answered. Giving it additional though today, I realize I eat in spirals now, as I find it easier to keep from getting butter all over my face that way. I have not had corn on the cob since growing out my beard, but I suspect there’s nothing I can do to keep the butter out of my moustache in future cob sessions. I’m a bit skeptical of the claim that most survey takers did not notice the connection between the two questions. Or at least, survey takers who actual understand enough advanced mathematics for the question to be relevant. This is a fairly well known urban legend in the mathematical community. Surely anyone who has heard the story would remember it when asked about corn cob eating practices, since I imagine 99% of the time this concept comes up it is in the context of said urban legend. If the result had been significant, I would identify this as the likely source of bias. Since the result was insignificant anyways, I suppose it doesn’t matter. I was definitely aware of it, but only because it was mentioned in the comments of the survey post which I read before taking the survey. comments of the survey post which I read before taking the survey. I honestly don’t know the scientific consensus on this kind of problem, wherein pre-knowledge of a survey may bias results; however, you have to know this will be a significant fraction of the survey takes. I was aware there was supposed to be a correlation, but did not remember which was it was supposed to go. Apparently, I am an algebraist who eats like an analyst in an unusual but not a radical way which carries no information about my other preferences. I’d never heard about it before. I have a Ph.D in mathematics, consider myself an analyst, and eat corn in rows. If “eating-in-spirals is more common among more recent immigrant groups”, perhaps this is a causative effect: as some group stays in America longer, they tend to eat-in-rows more frequently. I’ll assume corn on the cob is more available to people in America than elsewhere. Running with the idea, we’d then suspect that eating-in-rows has some meme-evolutionary advantage to it. Perhaps it’s more efficient somehow, perhaps it looks more polite in some circumstances… We’d probably expect the effect to be stronger among people who’ve spent a long time in places where corn is relatively cheap, and therefore more frequently eaten. Iowa, Illinois, and Nebraska were apparently the top three corn producers in 2016. Is there a stronger effect there? If rotating the corn is slightly more effortful than moving it, then eating-in-rows would seem to have a slight efficiency advantage. Has anyone ever consciously decided on one strategy over the other? If so, what were your reasons? 93 out of 219 Americans in those 3 states (42.5%) eat in spirals. 1046 out of 3529 Americans in the other 47 states (29.6%) eat in spirals. This is significant at p<0.001, but it's in the wrong direction. Interesting. Current state isn’t necessarily the same as the state they (and family) have spent the most time in, but it’s probably an indicator… and, among readers of this blog, I’d guess that when they move, they’d tend to move into high-tech areas, so I would guess that it’s in fact a relatively strong indicator. My guess is therefore contraindicated. Hmm, I dunno then. Simpler explanation: I have a vague hunch that I picked up my corn eating preference from watching cartoons. I suspect that typewriter style (rows) is the dominant corn eating style in such cartoons (think things like Loony Toons etc.). Does anyone care to do an analysis based on age groups likely to have watched such cartoons? Do programmers who eat corn-on-the-cob emit CR LF or Just LF at the end of each row in correspondence with their operating system preference? And is the cob terminated with null or EOF? This question is weirdly phrased. If it were “do programmers who eat in rows use Windows while programmers who eat in spirals use Linux?”, I would understand what you meant. (While suspecting that both groups mostly use Windows for the obvious reason.) You also seem to have omitted the Mac convention of CR without LF. But it’s very unusual for programmers to choose whether to emit a CRLF or LF. Everyone, regardless of whether they eat corn-on-the-cob, emits the endline that corresponds to their operating system, because the string in your program looks like “Hello World!\n”, not “Hello World!\x0d\x0a”. I have more than a vague hunch. I know, without a doubt, that this is how I picked up my corn eating habits, and reference the mental image pretty much every time I eat corn on the cob. When I saw this result, my immediate mental response was, “yeah, those are the cultures that grew up on those cartoons.” I wouldn’t be at all surprised if they were even the root cause of the popularity of that style of corn-eating. After all, it’s the sort of visual gag that works perfectly in cartoons, the character eating corn with the typewriter noise in the background and a ping whenever they move up a row, and that sort of visual gag was especially popular in early cartoons. I know for sure I’ve seen it in Loony Tunes, Disney, and Popeye cartoons at a bare minimum, and wouldn’t be surprised if cartoons from other studios were doing it, too. Even if it wasn’t as disproportionately popular among English-speaking whites back then as it is now, it’s the sort of thing I could imagine cartoonists would think of independently. From there, it would presumably catch on, even to people who didn’t grow up with those cartoons, by watching those who did. Also, wouldn’t the original question have been more effective if it included an option along the lines of: “I am somewhat, but not extremely, well-versed in advanced mathematics, but I think I would prefer algebra/analysis”? A lot of those responses would be trash, but I feel it would have drawn a lot of the lizard-men away from the “I know what I’m talking about, and I prefer algebra/analysis” answers, and allowed you to more accurately interpret the results of those groups. Reading this, I imagined that eating in columns might make neater leftovers if you expect you might not eat the whole cob (you could just cut off the eaten part). This wouldn’t enter into consideration if you normally eat the whole thing. Partially eaten leftover corn on the cob sounds…unappetizing. One thing I don’t understand. Why is it “Indian, Hindu” as opposed to simply “Indian”? Is it merely because all 77 Indians who answered both questions were Hindu, or something else? Because Indians were less spirally than that, and I only got that by looking at the subset of Indians who gave their religion as Hindu. Maybe the Muslim Indians are more likely to eat in rows or something. :look of horror: Garden of forking paths! Have you checked the preference of elderly Hispanic women? My guess: Remove corn from cob, treat with potash, grind, form into round, grill. It is appropriate when you do a followup study to test the result you found. It’s inappropriate when there’s no followup study, as here. Add it to the list of wacky psychology results that failed to replicate. Seriously, I would be worried if this were true. It fails the famous grandma test: psych studies can never tell you anything that your grandma doesn’t already know. I’m not sure my grandma knows what algebra vs. analysis is. My grandma would have. But then my grandpa is a mathematician. 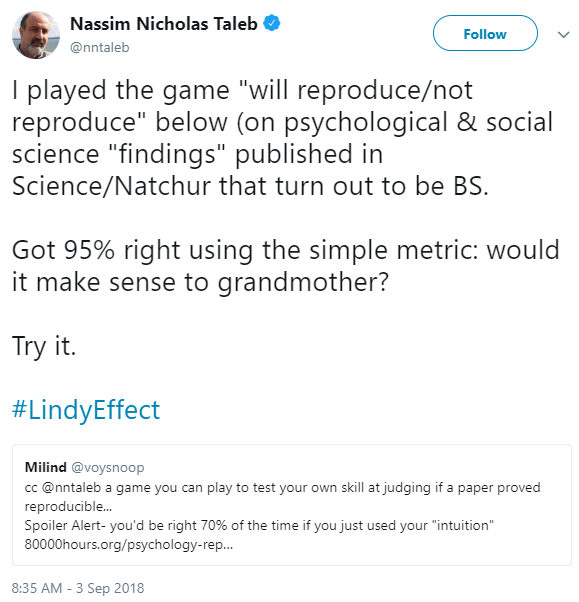 Wasn’t the ‘famous grandma test’ specifically about Nassim Nicholas Taleb’s grandmother? Or is he merely derivative? This question is a perfect example of why it might be worthwhile to consider a follow-up survey after the annual survey. The point would be not so much to ask if a respondent’s answer changed, but simply if a respondent even remembered his or her response correctly. For a certain questions I had to reason out or strain to remember my answer. For some of those questions, I expect my reasoning yields consistent results. For a few other questions, my answer was on the border between responses. On a given day, my reasoning might lead me to one or another of two answers. I don’t know what I answered for (the corn part of) this question. I definitely remember my answer (rows), but having been thinking about far more than I should be over the course of the discussion, I think I might have been wrong. I think I ate in rows when I was younger (which, as I believe I mentioned in some other thread, I believe was influenced by eating corn=typewriter gag from cartoons), but at some point I think I switched to spirals (which I would call vertical rows, because I eat one full circle around the cob, then move one bit-size over and eat another full circle). I also think I might alternate between the two although I’m not sure what would cause me to eat a particular cob a given way. I’m not sure how relevant it is, but I was surprised by the suggestion that corn-on-the-cob could be eaten in any way other than in rows. We discussed the survey in my household while eating corn-on-the-cob, and neither of my housemates had encountered the idea that it could be eaten in spirals. We are all British and one of us is racially East Asian (born to Hindu parents) and also an algebraist. He did then try eating his corn-on-the-cob in a spiral pattern and reported enjoying it. Did you analyse by nationality? I’m wondering whether all British people eat it in rows. This would be extremely unusual. In American usage, East Asian refers specifically to Chinese, Japanese, and Koreans, and potentially other people from the same general area who look broadly like they do, like Mongols. It cannot refer to Indians. I would expect a Hindu to be “South Asian”. It might also bear pointing out that (in American usage again) “Asian”, without qualification, will generally be understood to mean East Asian. I understand that in Britain an “Asian” is typically Indian/Pakistani due to the aftereffects of the Raj. In normal usage in the UK Asian means South Asian, unless it means Asian more generally. Since we abandoned Oriental there has been no standard term for East or South-East Asians, who tend to be regfered to by national groupings. I like butter with corn on the cob, so it’s easier/less messy to spread some along a row then eat the row. I chose Algebra as well but I don’t like butter with that. I don’t think I’ve ever seen that…as far as I can recall most people butter the cob, add salt/pepper to taste, and then eat. I don’t think I’ve ever seen someone re-butter each row. I don’t think you’re alone in liking butter with corn on the cob, I’m pretty sure that is the standard preparation. I am also a repeated cob butterer, but I also eat in rows and hate analysis. In general equations run more smoothly if you add butter. Of course, the downside of this has been the splitting of all mathematical fields into vegan and non-vegan fields, and resultant unpleasantness. I’ll just note that the phrasing is confusing. It took me a minute to figure out what “spirals” meant at first…I don’t think spiral is the best description for it (because spiral implies that you would be leaving uneaten bands around the cob). You either eat horizontally, rotate the cob, and then eat horizontal again OR rotate the cob as you eat, then move the cob horizontally and rotate again. Could either of those be construed as rows (essentially vertical vs. horizontal)? At the very least, it seems hard to describe either as a spiral. If respondents considered their vertical rows (which the survey intended to be spirals) as rows, that would result in an over-representation of rows (and rows seems to be the more common option). Well, I don’t know about all the other claimed “spiral-eaters”, but I really do eat corn on the cob with a spiral; I eat it more-or-less vertically at a slight angle, such that I don’t have to shift sideways at each 360-degree turn of the cob. I don’t know what the mathematical term is, but I would describe the spiral as being “compact”, so there are no uneaten bands around the cob, but only a small one at the start and end, which are easily taken care of. arabaga’s post is a dead give-away: the reason Indian people prefer to eat corn in spirals is that they generally eat with their fingers, using the right hand only. And I dare say that’s the reason for the East Asian bias, too. I mean, I don’t eat corn with chopsticks, but who doesn’t eat corn cob with hands? I think the point is that East Indians traditionally eat food in general with their fingers, using only the right hand. I’m pretty sure that pattern applies to at least some cultures, am guessing that it applies to East Indians. It does with the pattern in some Islamic societies of using the right hand for clean purposes, the left hand for unclean purposes. I eat corn on the cob with my hands, although sometimes with little spiky things stuck into the ends to hold, but I don’t eat it with only my right hand. One thing that occurred to me while taking the survey was that self-description of how one eats corn could easily be inaccurate. Ben Tilly’s original blog post described observing the correlation spontaneously. Maybe people who are asked how they eat corn just envision “someone eating corn”, and the typewriter depiction is more common in culture? I also agree that the “spirals” description is a bit strange; I think I understood what Tilly’s post meant, but I’m even still not quite sure. It’s possible this sort of confusion biases the overall estimate of row-eaters vs. spiral eaters, but in order to salvage the original effect, you’d need to postulate that Analysts were significantly more likely to misunderstand the question than Algebraists. Realizing that I could have said “cornfusion” but it’s too late to edit my comment. Full of regret. If you wanted to extract the effect from this data, I guess? But if practically everyone uses a different brain mechanism for “trying to determine which way they eat corn off the cuff” versus “actually eating corn without thinking about it” then the entire set of results could just be irrelevant. It’s like “how many breaths do you take in a minute” or “what do you look at in the room when you’re not trying to look at anything”; if you have to be the one to do the measuring, then (maybe unless you’re very good at meditation) as soon as you’ve engaged with the question you’ve destroyed the answer. Added: To be more clear, the hypothesis I’m introducing is that the vast majority of the results were culture-biased but ultimately random guesses, so typewriter style gets a boost because it’s more immediately legible, but not necessarily a massive one, and any preexisting correlation is gone. Maybe people who are asked how they eat corn just envision “someone eating corn”, and the typewriter depiction is more common in culture? Vouching for this. Shortly after finishing the survey I was second-guessing myself—”when’s the last time I ate corn on the cob anyway?” I’m considerably less sure that I actually eat in rows at the moment, but in my case I’m neither a mathematician nor in any of the other groups described in the post, so no matter. When I was a kid, I ate in columns, but I was specifically instructed by my dad (Italian background) to eat in rows, so I eat in rows now. Some of the original incident could be explained by people who work together, and get on well, copying each other’s corn eating styles without being conscious of it. So, I sit down next to my friend, with whom I share many interests and perhaps field of study, and they are eating corn in the typewriter style. I don’t have strong tendencies on how to eat my corn but my predictive model now says that’s how I’m going to eat it, without me having to consciously think about that. Do I get any kind of SSC points for bringing even this topic back around to predictive processing? I didn’t mean to, I promise. I struggled with this question. I eat some of the corn on the cob and put it down. Then I pick it up later and eat some more from a more or less random location. And so on until it is all gone. For me eating in rows or spirals is a bit odd really. Same. I tend to eat from the middle towards the ends (the middle is better, so if I’m not going to finish it I’d rather leave the less-good stuff.) But nothing as organized as a spiral, and absolutely not rows. I believe this means you are a statistician. I didn’t understand either question as intended – to me, the math culture divide is algebra/geometry (Poincare called the divide analysis/geometry, with “analysis” meaning the opposite of what it means here – though this might be a quirk of whatever translation from French I read), and I completely misunderstood “rows” and “spirals” (I’m still not sure I get it as intended – but I answered “rows” because what was actually meant by “rows” was so unthinkable to me that I assumed “rows” meant what was intended by “spirals”). I interpret “rows” here as “along the rows of kernels, from end-to-end, linearly”. (Not the possible notional rows that circle the length of the cylinder. Maize is a crop from the New World. If eating preference is closely aligned to migratory patterns to North America, perhaps this indicates a normalization effect, where people are initially exposed to the crop and wonder how to eat it, so anything goes. But then later they are exposed to the correct way to eat it and bias in that direction. To test this hypothesis, we would need to look at number of years (or perhaps generations) in the US (for US immigrants) versus corn-eating preference. If you butter your corn and you are averse to letting it drip everywhere, you will eat your corn in loose spirals – a short row, rotate, a short row, rotate. It’s just basic butter management, people! Are Asians bigger butterers? I don’t know. We should find out. If not, and Asians use the same amount of butter as Whites on average, this could imply higher fastidiousness. But if Asians are less avid butterers, buddy I don’t know what to tell ya. ahh- true, but it can also be: Eat row, dip next row in butter splotch on plate, eat that row, etc. Food in China is made with immense quantities of fat. It’s ridiculous. But as you surmise, the Chinese overwhelmingly use vegetable oil, not butter. Asians tend to use no butter at all with their corn. Very little seasoning, if any. Darn it! I thought I had finally a way to figure out whether I’m an algebraist or an analyst. Now, after reading this post I’m not even sure how I eat corn anymore. There may be an Alfred E Neuman factor for the Americans. I read Mad Magazine, and I am not going to look like Alfred with his spiral row of missed kernels! > so, what determines this? I analyzed this question by gender, race, ethnicity, subethnicity, religion, sexual orientation, social class, neurotype, and political affiliation (I love this dataset so much). Aren’t we getting close to p-hacking territory here considering just how many possible combinations you have at your disposal there? But I suppose if Scott is honest about the attempts he made, it can be factored into the significance test. It would only be p-hacking if Scott had done this to select his hypothesis surely? Here it is just using the data to prove the pattern is generally the same. And what happens if I analyse this variable against all the others in my dataset is a perfectly valid thing to do anyway (not that Scott did it here, as he had a hypothesis he was testing). It’s only doing this and then retrofitting a hypothesis which is problematical. Look at this cool thing I’ve found playing with the data seems to me to be the heart of good science. Do people who eat in rows boustrophedon? Or do they carriage return and line feed like a typewriter? If the latter, does eating direction correspond to reading direction? I carriage return, and I go left to right, but I carriage return up, not down. My S.O. and usually notice when eating CotC that I eat in rows and she eats in spirals. I think it’s fine, but she thinks I’m weird. I like math (I volunteer at the JRMF), but don’t have an advanced degree. She’s not particularly into math, though she did work in Software most of her career. As to the boustrophedon question, I’m more of a reverse typewriter eater. I start on the right end of the cob and move left. Occasionally I’ll do a row boustrophically, but that’s the exception, not the rule. I was annoyed by this question on the survey because I slice the corn off of the cob with a knife and then eat it with a fork. A lot less messy and much lower likelihood of getting corn stuck in your teeth. This is like eating pizza or french fries with a knife and fork…perfectly reasonable to me in theory but appalling in practice. I ate french fries with a fork about two weeks ago. Context: They were shoestring fries and I have a habit of dousing – I mean really drenching – my fries in hot sauce. That combo means that I normally have to wipe my hands many times through the meal. Resorting to a fork saves a lot of trouble. How do Bayesians eat corn? Clearly P(Bayesians eat in rows | Bayesians don’t have corn) = 0; you can’t eat corn you don’t have. So P(Bayesians don’t have corn | Bayesians eat in rows) is also 0. And P(Bayesians have corn | Bayesians eat in rows) is 1. P(Bayesians eat in rows | Bayesians have corn) = P(Bayesians eat in rows AND Bayesians have corn)/ P(Bayesians have corn), by the definition of conditional probability. Thus, we can say that if ever a Bayesian is without corn, they don’t eat in rows. Since no one can have corn all the time, Bayesians do not eat in rows. * Yes, yes, we knew that already. There are 1.6 algebraists per analyst. This really surprises me! Is this reflective of the sizes of each field, or does SSC draw more algebraists than analysts? Random hypothesis: I have the impression that algebra-preference clusters with verbal intelligence > spatial, and analysis-preference clusters with spatial intelligence > verbal. I would be surprised if this effect was strong enough to explain the numbers difference, but not surprised if it had some non-negligible effect. There was no sign of this in the data; algebraists (.9921) and analysts (.9894) had nearly the same SAT verbal/math score ratio (p = 0.58). I know the folks on this blog tend to be both smart and STEM oriented, but is it possible that a sizable enough portion of respondents to matter either don’t truly understand the difference between those math types, or that they don’t spend enough time immersed in math to really have a preference? It’s worth mentioning that the two corn-eating techniques discussed here have been studied in rats foraging on the pine cones in Israel. It turned out that prefered ways to strip a cone were culturally inherited, i.e. young rats learnt from their mothers. Also, the spiralling technique proved to be more efficient. Zohar, Terkel, 1996. Social and environmental factors modulate the learning of pine-cone stripping techniques by black rats, Rattus rattus // Animal Behaviour, Vo. 51 (3): 611-618. What is most shocking to me about this is that there are people who prefer algebra to analysis at all. And they are apparently the majority! Algebra is so tidy and boring. Analysis is so deep an mysterious. In algebra equalities are trivial, in analysis an equality if a conjunction of two inequalities. He would say that after having proven some equality the analytical way. The algebraic type was dismissed as trivial and left for the students to work out at home. IIRC the rest of mathematical physics faculty expressed similar sentiments. This quote captures my feelings about the issue. It’s easier to have good mental models of algebraic objects. To the point where after you have proven a theorem, you can see that it simply must be so. It’s impossible to even imagine 2+2 being anything but 4 in my mental model of addition of integers. In analysis on the other hand, when continuous spaces enter the picture (especially infinite-dimensional spaces) there are lots of statements that remain counter-intuitive even after I have proven them to be true. My experience is that algebra attracts people who are very excited by abstraction. There’s a lot less potential for abstraction in analysis-heavy fields. Since the cob has a natural axis of rotation about which it is (to a first approximation) rotationally symmetric, I prefer to refer to “by rows” and “by spirals” as longitudinally and latitudinally, respectively. My family members, who do not live on Uranus, found this nomenclature confusing. But they eat longitudinally, so I discount their opinion. 😀 I eat latitudinally, minimizing the amount of time that the rotational symmetry is broken, and the amount of time that there are buttery uneaten kernels near my chin. I was under the impression that corn on the cob was a dish mainly enjoyed by Americans because sweet corn is a not as popular in other countries and most of the corn grown is dent corn used for cornmeal. What other countries eat alot of corn on the cob? Mexico. It’s a pretty common food here, to the point where (at least around central Mexico) you’ll find it commonly sold on the street. It’s not usually sweet corn that’s used, but cacahuazintle, which I believe is a variety of dent corn. Corn on the cob is popular in eastern Europe, especially on beaches. Corn may not be a staple food in Europe, but it is still widely consumed in many forms. Corn on the cob is very popular in Eastern Europe, especially as a beach food. I feel like this needs elaboration. Brazilian here, talking about Brazil. Vendors with human-pulled carts on the sand will sell the beachgoers corn on the cob. The cart has a big pan in it, full of hot water with corns immersed. A smaller, plastic pot has salty water to salt the corn at the consumer’s preference (that’s table salt diluted in potable water, not sea water). There’s also regular powder salt, and a squeezable bottle of liquid butter. Very common on crowded beaches. I happen to be on vacation by the beach, and I see them every day. China and Japan, and I believe other East Asian countries. It tends to be roasted, not boiled. So, fully 1/3 of SSC survey takers are well versed in academic mathematics? This seems implausible. Mind you, I have an undergraduate degree in Mathematics and I would’t know what this split refers to without looking it up. I’m undergrad in math, too, but it doesn’t sound too implausible to me that 1/3 know algebra vs analysis (though I would’ve guessed a bit lower). A lot of my STEM friends know the difference, and SSC seems to attract a lot of STEM folks. Some of the first courses you’re likely to take past engineering math are real analysis and some sort of group theory, at which point you probably learn of the higher math definitions of “analysis” and “algebra”. My college actually divided its math department by algebra, analysis, and geometry, so it was hard not to learn about this distinction if you did STEM. I’ve made an interactive page that displays all the results of the survey. If you filter the data by any field, all the other graphs on the page update. So you can easily see what people who gave a particular answer for one question answered on all the others. It should also fix some of the issues that users were having with the google survey results page, where certain results weren’t being graphed. What did you do to clean the data? You merged a bunch of state and country answers (eg, “Belgium” and “Belgium ” or MD and Maryland). Could you publish the code for that? What did you do with things like “Turkey / Netherlands”? For State you seem to have deleted a lot of non-US states, like Saskatchewan, but kept others, like New South Wales. If you’re going to keep some, why delete others? If you’re going to keep both Nsw and New South Wales, you should merge them; Pr and Puerto Rico. You kept Bc, but deleted British Columbia?